Drinking pomegranate juice as part of a daily balanced diet is one of the natural ways to lower cholesterol properties. Although it is unclear as to whether or not drinking pomegranate juice as one of the natural ways to lower cholesterol is truly effective, it does seem that there is support for the juice blocking or slowing down the buildup of cholesterol in the arteries. What does that mean for you exactly? Cholesterol is a waxy, fatty type substance that the body naturally produces itself for essential functions such as the formation of cell membranes, hormones, and bile acids. The amount the body produces is just right and enables our bodies to function at optimal levels. However, when we eat foods that are high in cholesterol and fat (meat and dairy), we increase the chances of too much cholesterol building up in our arteries. This unnatural amount of cholesterol buildup is referred to as plaque. Cholesterol levels can become very dangerous and even fatal if not addressed and treated properly. If the plaque is allowed to build up within the arteries, the arteries don’t have enough space to allow the blood to flow through properly. The arteries become blocked and can harden as a result. The brain can be damaged, as well as the heart and other organs of the body that are vital for health and life. It’s common knowledge that high levels of cholesterol in the blood can cause a stroke or heart attack. So, what can you do to stop the unnatural build up of this waxy, fatty substance? Pomegranate juice contains antioxidants. Antioxidants have proven effective against bad cholesterol, or LDL levels. If antioxidants can lower the bad cholesterol in the body, then doesn’t it make sense to take in as many of them as possible? The antioxidants also combat free radicals, which help the body, resist a state of oxidative stress, which helps the LDL levels stay low. One study conducted in 2004 by Israeli researchers concluded that people who drank one glass of pomegranate juice daily significantly lowered the LDL cholesterol oxidation process. In another study, the good cholesterol, or HDL, was actually increased as a result of drinking pomegranate juice every day. The research conducted to date on whether drinking pomegranate juice as one of the natural ways to lower cholesterol is still considered preliminary. However, another study that was conducted on human arteries indicated that something in the juice could possibly reduce the development of atherosclerotic lesions. Because high levels of cholesterol are connected directly to atherosclerosis, heart disease, and stroke, the reduction of these lesions could be very significant in the prevention of heart disease or stroke. 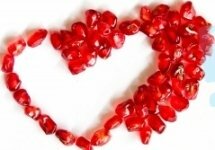 Can Pomegranate Juice as One of the Natural Ways to Lower Cholesterol for Patients Prove Effective? Pomegranate juice could be promising when it comes to treating or preventing the build up of too much cholesterol in the arteries. Whether or not you develop cholesterol can be a result of genetics. However, you can control your cholesterol with exercise, a balanced diet, and, if necessary, medications. Why not add pomegranate juice to your diet as a preventive measure today? It tastes delicious and holds great promise for positive effects on overall health. If you’re currently already taking medications to lower your cholesterol, talk to your physician about adding pomegranate juice to your regimen before doing so. Read enough about natural ways to lower cholesterol and want to discover other health benefits of pomegranate juice?